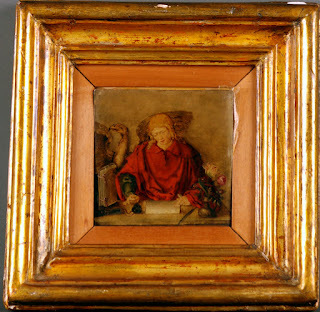 In the Fall 2011 issue of The Journal of Art Crime, Lilian and Dieter Noack of the Daumier Register announced that they had pinned down the the location of two paintings by the French painter and lithographer Honoré Daumier (1808-78) whose whereabouts had been previously unknown to the Swiss-based website that has the mission of identifying the works of the satirist of French society and politics. 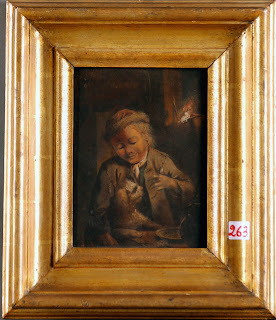 The Daumier Register keeps a list of "Lost and Missing Paintings" and "Stolen and Looted Paintings". Daumier’s (“Femme avec deux enfants” / “Mother with her children” (numbered as DR7196 in the Daumier Register) is an oil painting (1865/68) that has been in the collection of the National Museum of Serbia in Belgrave, Serbia, since 1949, according to the Noacks, founders of the Daumier register, who report that "rumours about the theft of the picture are thus unfounded." 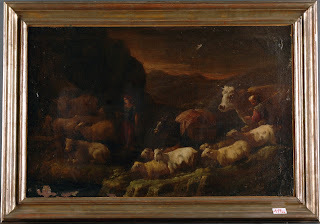 The painting was reportedly owned by Ambroise Vollard, a Parisian art dealer who died in an auto accident in 1939 whose assistant Erich Schlomovic, a young Croatian Jew, exhibited the painting in Zagreb in 1940. 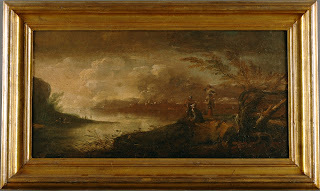 The painting was also exhibited in Prague, 1971; Zagreb again in 1989-90; Japan, 2005-6; and in Como, Italy, in 2007. 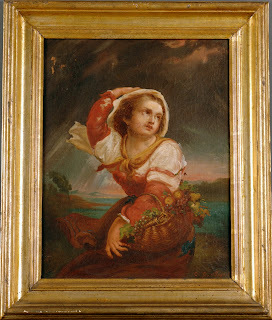 The communist government of Yugoslavia incorporated the painting into the state's collection after World War II. [Schlomovic was murdered at the age of 27 in a mobile gas chamber in 1942). The National Museum of Serbia in Belgrade closed its permanent collection on June 1, 2003, for a reconstruction. 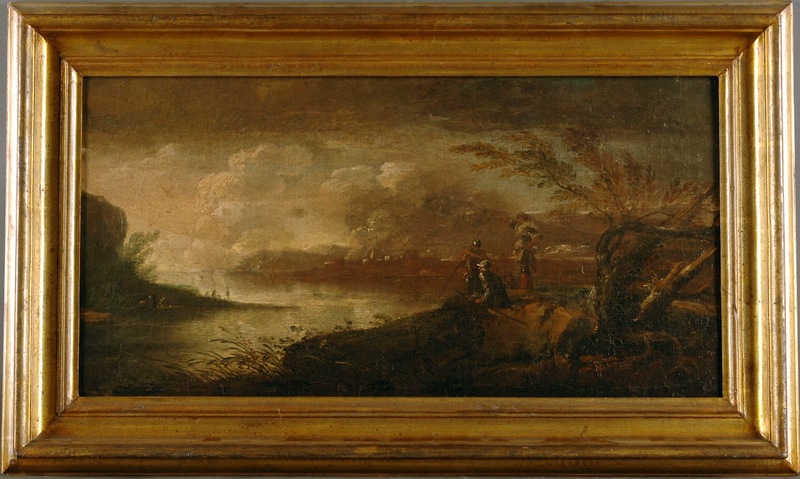 The second painting, DR9119 (“Un wagon de troisième classe “ / “Third Class “ / “Wagen dritter Klasse’) had disappeared after it had been sold in 1982 at Drouot Auction in Paris. 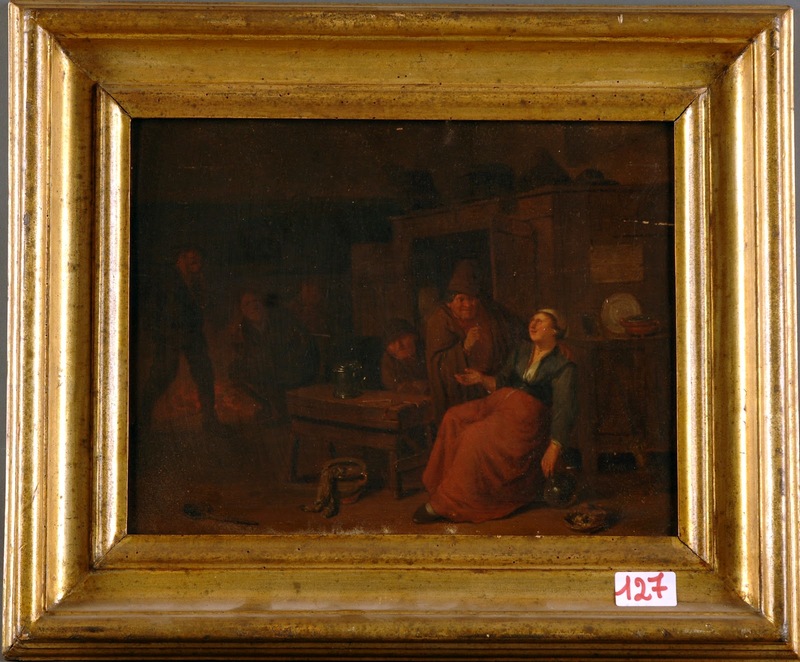 It was part of two Daumier paintings (the second being DR7005), which belonged to the estate of Parisian industrialist Roger Leybold (1896-1970) and shows an interesting Third Class Carriage scene, according to the Daumier Register. 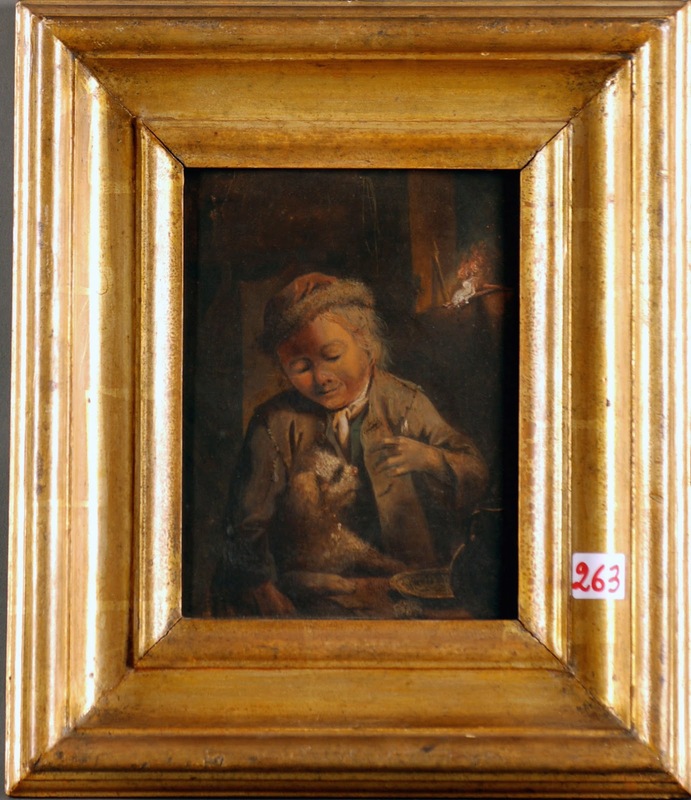 "We were informed by the owners that it was offered for sale in 2011 by Galerie AB in Paris where it had been stored since 1982," Daumier Register reported. You may read more about the background of this painting here. The International Foundation for Art Research (IFAR) lists sources, including the Daumier Register, to obtain information on the body of work (catalogues raisonnés) for Honoré Daumier. 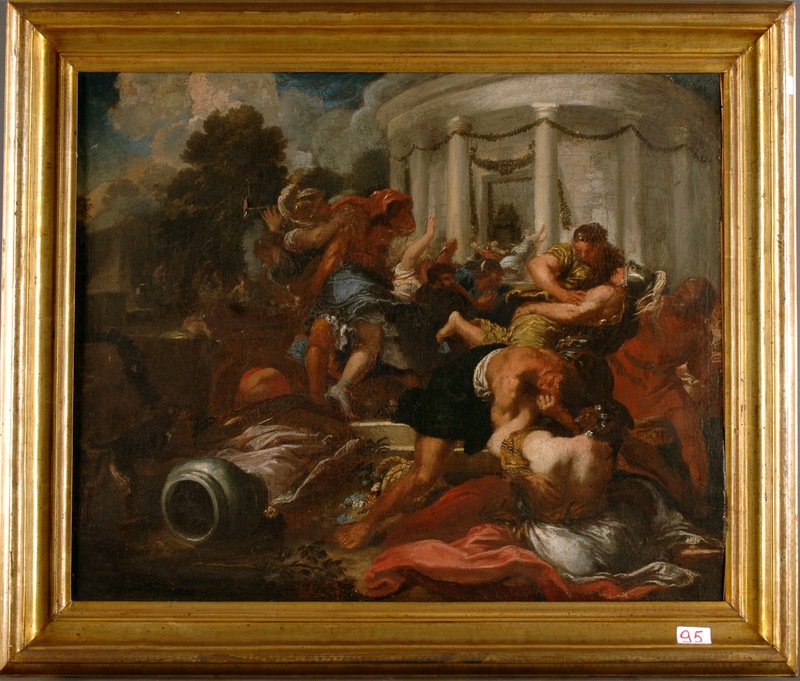 The proposed Senate Bill S. 2212, the Foreign Cultural Exchange Jurisdictional, is the biggest threat to date of making legal claims for stolen art, according to Marc Masurovsky, a Washington, DC-based historian and a former researcher director for the Presidential Advisory Commission on Holocaust-era Assets. The bill was sponsored by Senator Dianne Feinstein (1992-2012), a Democrat from California, who introduced the bill on March 20th to "clarify the exception to foreign sovereign immunity set forth in section 1605 (a)(3) title 28, United States code. 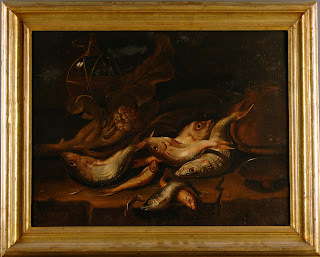 "S. 2212 will immunize most looted art coming into the United States," Masurovsky wrote on a message on Facebook. According to Govtrack.us, the bill is in the first stage of the legislative process: "Most bills and resolutions are assigned to committees which consider them before they move to the House or Senate as a whole ... The sponsor [Feinstein] is a member of the Senate Committee on the Judiciary, where the bill has been referred." The bill is co-sponsored by Senator Orrin Hatch (Republican-Utah), another member of the senate's judiciary committee. Govtrack.us also identifies this bill as related to another in the House of Representatives: H. R. 4086 of the same name. "The backers of these two bills have asked Jewish groups, claimants and other interested parties, to make a choice: by opting for a limited category of art objects to be claimed in US courts that would come in from abroad for "cultural display," Masurovsky wrote in an email. "They will allow all other looted art objects to enter the US without any possible legal recourse to seek restitution of those objects in a US court of law." 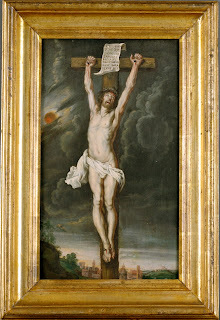 Last November, a Florida U. S. Attorney seized a 16th century painting (Girolamo Romano's Christ Carrying the Cross Dragged by a Rogue (1538) from the permanent collection of Italy's Pinacoteca di Brera in Milano loaned for an exhibit at the Mary Brogan Museum of Art and Science in Tallahassee. 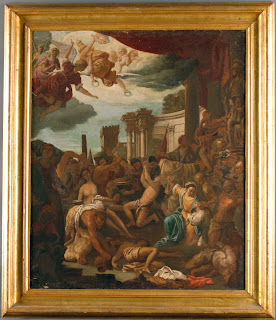 In February, a U. S. judge ordered the painting to be returned to the heirs of Frederico Gentili di Giuseppe, an Italian Jew who died in Paris before the Nazis invaded France. "The case in Tallahassee could never have occurred had the bill been passed last year," Masurovsky explains. "The question remains also whether Wally could have been made possible had the bill existed in 1997 as well as the Altman v. Republic of Austria and all of the Max Stern Estate seizures in the US." The bill distinguishes that the artworks is a cultural object and not to be considered to be a commercial activity. "NAZI-ERA CLAIMS. -- Paragraph (1) shall not apply in any case in which -- (A) the action is based upon a claim that the work was taken in Europe in violation of international law by a covered government during the covered period; (B) the court determines that the activity associated with the exhibition or display is commercial activity; and (C) a determination under subparagraph (B) is necessary for the court to exercise jurisdiction over the foreign state under subsection (a)(3)." The "covered government" involves the Nazi's Third Reich regime and the "covered period" is specified as January 30, 1933, through May 8, 1945." This S.2212 aims to prevent seizures such as the one in the Florida case above. "I have three basic comments: the first is to acknowledge that the intention on the part of Feinstein and Hatch comes from the right emotional place and even to laud their intention, but to suggest that they are simply being misguided; to wit (and here is my second comment, which is essentially to repeat virtually what Marc has said with regard to the danger of so narrowing the focus on Nazi-plundered art): that the result is to make the coming of all other kinds of plundered art into the United States immune not just from seizure, but from being recognized as plundered; the effect for archaeological artifacts in particular is potentially disastrous. "My third comment, related to the second, is that the narrowing of focus that the bill proposes adds another aspect of looking at the Holocaust as an event specifically Jewish or specifically European or specifically whatever, which enables people to ignore the larger issue, the human issue, of which it is part, and which "largeness" is evidenced by the depressing number of Holocaust-like events to which one can point across the planet both before and after World War II -- which is analogous to the broad range of culture plunder both before and after. If, with all of its unique aspects (of which are plenty) we simply view it as an aberration, we no longer have to ask as many questions about ourselves, we no longer have to think as much--and that is a profound danger particularly to the American people, with ramifications beyond this issue." Preet Bharara, the United States Attorney for the Southern District of New York, announced that James Stephen Biear, 51, of Ossining, New York, was sentenced today to 10 years in prison for stealing $3.2 million and artwork, including Andy Warhol's silkscreen on a wooden crate, mimicking a Heinz 57 case of ketchup (the "Warhol Heinz 57 box"), from his former employer, an elderly millionaire. Biear was found guilty on November 22, 2010 of 10 counts of interstate transportation of stolen property, wire, mail, bank, and credit card fraud and money laundering, after a two-week jury trial. Biear was sentenced today in Manhattan federal court by U. S. District Judge P. Kevin Castel, who also presided over the trial. In addition to the prison term, which reflected sentencing enhancements for abusing a position of trust and a vulnerable victim, Judge Castel sentenced Biear to four years of supervised release, imposed a $3.5 million forfeiture judgment, and ordered him to pay a $1,000 special assessment fee. Restitution will be determined at a later date. According to the FBI, in July 2008, Biear had sold the Andy Warhol artwork to an art collector in New York City for approximately $220,000. Biear falsely claimed at the sale that the Warhol Heinz 57 box had been owned by his uncle. 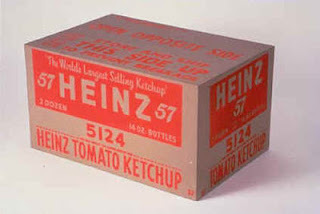 Warhol had gifted the Warhol Heinz 57 box to an art collector in 1964, and in April 2007 the artwork was noticed to be missing from the art collector's residence after a birthday party. Biear also stole "a playing card on paper by Marcel Duchamp, an ink drawing by Francis Picabia, a watercolor by Joe Brainard, and a charcoal drawing by Alex Katz, according to the FBI. 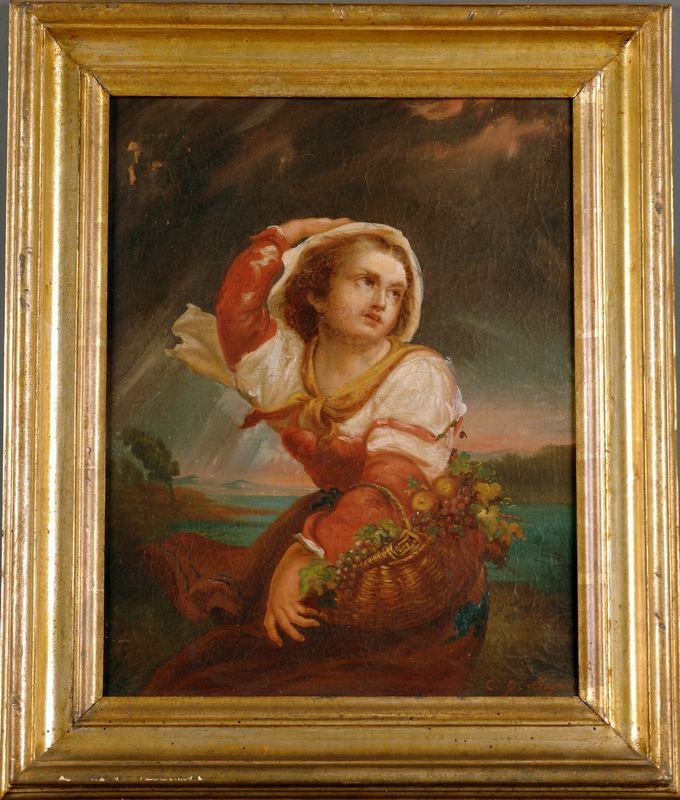 Biear filed a false insurance claim in August 2009 for a painting by a 19th century English artist that he claimed had been stolen from him, prosecutors say. 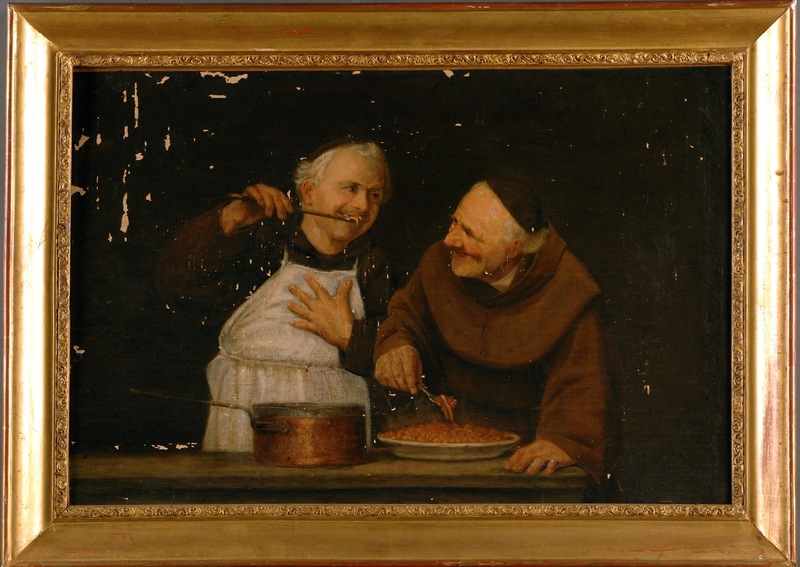 After an apparent tip from Biear's ex-wife, authorities ultimately found the piece in Biear's attic. Judge Arthur Tompkins, an instructor at ARCA's Postgraduate Certificate Program in International Art Crime and Cultural Heritage Protection Studies, also taught a course in February in his home country. ARCA Blog caught up with him to see how it went in New Zealand. Tell us about the Art Crime course you presented earlier this year at the University of Waikato? 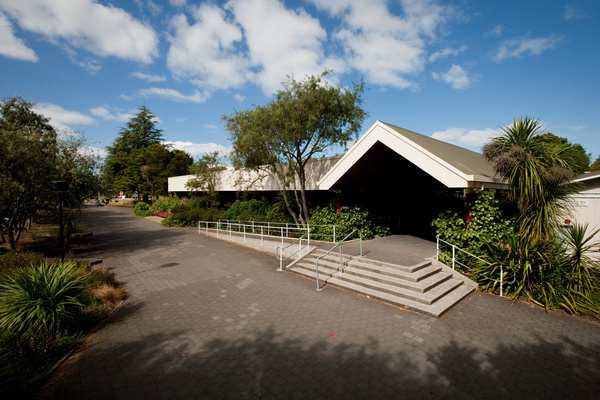 The University of Waikato's Law School hosted the course and offered it as a credit course to their own students. It was also offered as a non-credit coruse through the Continuing Education arm of the University. 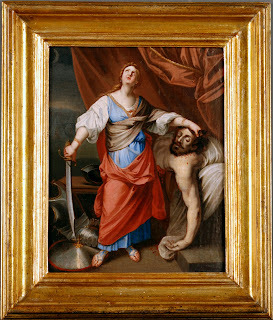 The course was entitled "Art Crime during Armed Conflict", and, similarly to the course I teach in Amelia as part of the ARCA Postgraduate, it was a five-day intensive course, comprising 5 hours of teaching each day for a week during the height of our Southern Hemisphere summer. We cover two thousand years of the history of art crime during war, and the international and private law responses to it. And all in five fun-filled and fascinating days! We ended up with 16 students in the group, from three countries and two hemispheres, with the largest sub-group being law students (I was teaching the course within a Law School, after all!). But the class also included a working artist, two art historians, a police officer, a doctor, an art gallery director, a cultural heritage worker, and others. It all made for a vibrant and energetic group, and we had some spirited discussions! And on the last day, ARCA's Noah Charney was able to join us, via Skype, from Slovenia, which was a real highlight. At least two of the group will be in Amelia for this year's Art Crime Conference on 23/24 June, and in addition, in the last few days, I have learnt that one of the group has been accepted into the full ARCA Postgraduate Program, so will get to spend the entire Italian summer living and studying in Amelia. It is likely that the course will be offered every second year at Waikato University, so the next occasion will be in February 2014. 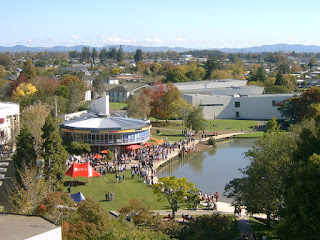 I am presently investigating offering a similar course elsewhere in New Zealand in the intervening year. What time period do students seem most interested in? Nazi theft? The students were from a wide range of backgrounds and interests, as I said, and I think that as a result no one area or era stood out. They have written (or are writing - the assignments from the for-credit students are due soon!) assignments on an equally wide range or topics - which is, I think, a testament to the breadth of scholarship that falls under the art crime umbrella. 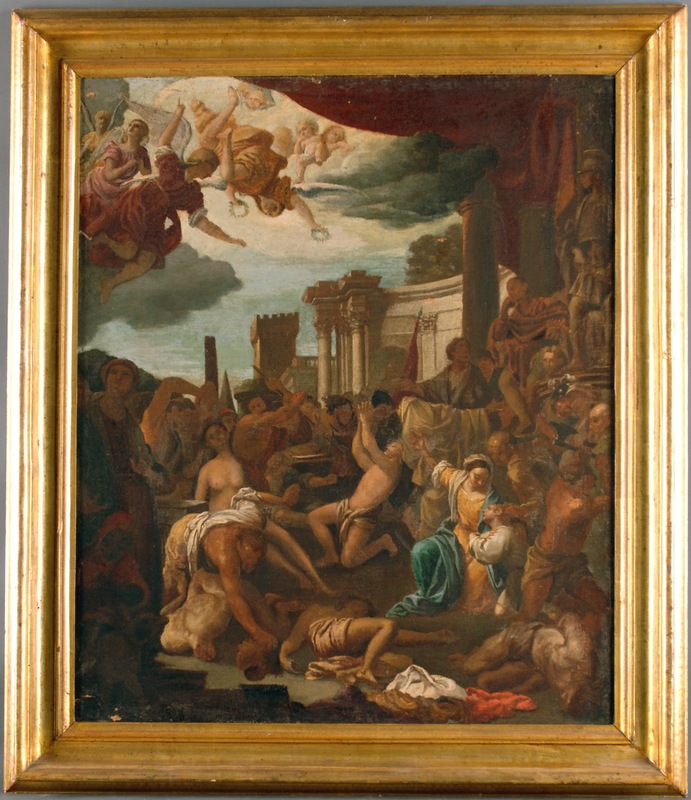 And because the course covers not only the historical background to art crimes during wars over the centuries, but also the international and national legal responses, there is something of real interest there for everyone. What do you think are the most contentious legal issues involved in conflict art? Two difficult issues continue stand out for me - first, the return of objects taken during past armed conflict, that are held currently by a state or national institution, and where there is a call for return. 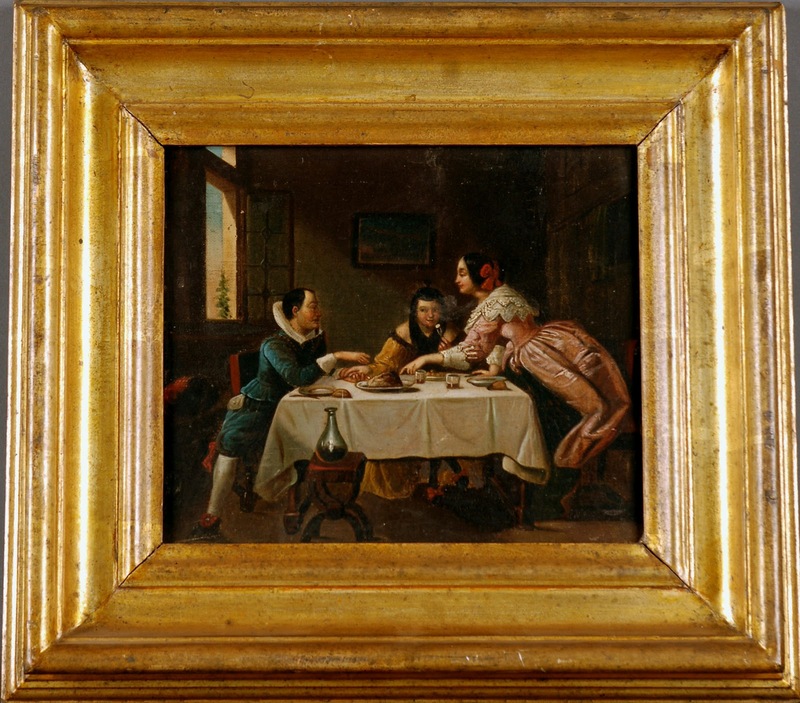 In that context no issue of private ownership arises, but rather the issue revolves around often contentious questions of the principles underlying the legal structures around the state's continued retention of the object, and the ability or willingness of a state, or its politicians, to relinquish possession. 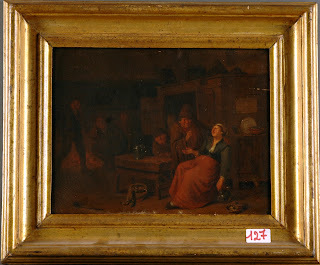 Secondly, the spectrum of responses by legal systems around the world to the bona fide purchaser rule - where someone has paid a reasonable price without knowledge of the fact that the item had in the past been stolen, do they or should they prevail over the original, dispossessed owner's rights? Different legal systems around the world adopt often mutually exclusive positions on this issue, and despite decades of work, the gulf remains unbridged. We need to find some way of reconciling the irreconcilable! In 2009 you spoke at the International Art Crime Conference in Amelia about a proposed International Art Crime Tribunal. As you have now taught this course three times, how have your ideas about an IACT evolved? What would it take to make it happen and what do you think would be some of the first cases that you would like to see be dealt with? I would still love to see such a Tribunal established, and nothing that I have seen or read or heard over the last three years has changed that view - to the contrary, there is still much to recommend it. The United Kingdom's Spoliation Panel has shown that a tribunal can effectively apply both legal and moral criteria when resolving claims to disputed art, and, whilst effective in some cases, the litigation experience in the United States shows that the resolution of such disputes by "traditional" adversarial litigation brings with it inevitable constraints, in terms of access to justice, the restrictions inherent in the rules of evidence a court applies, and a likely win/lose result paradigm. What would it need to make this happen? As I said to the ARCA Conference in 2010, it needs a champion on the world stage, and a real commitment by a group of states with a single voice in the forums of international law - particularly the United Nations and within that, UNESCO - to make it happen. Where either of those might be found, I do not know. Until then, it will remain a lonely idea wandering at large in the world, although I was very heartened to hear Pablo Ferri support the idea at last year's ARCA Conference! By the way, I still think, for a whole lot of reasons, that Florence would be a very suitable seat for such a Tribunal! Courthouse News Service Reports "California Law on Nazi Art Won't Aid Dutch Heir"
Lucas Cranach the Elder's diptych "Adam" and "Eve"
March 27 Maria Dinzeo reported for Courthouse News Service that "California Law on Nazi Art Won't Aid Dutch Heir" in the case of the Goudstikker family against the Norton Simon Museum in Pasadena for the diptych "Adam" and "Eve" by Lucas Cranach the Elder. U. S. District Court Judge John F. Walter has written that the heirs are preempted by a foreign affairs doctrine. Judge Walter sits on the U. S. District Court for the Central District of California. 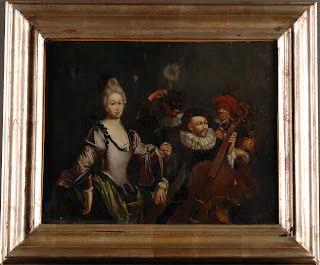 ARCA blog previously covered the background of this case and the paintings in the fall of 2010 here, here and here. The American Institute for Roman Culture held its annual “Unlisted” conference in Rome last weekend. The two-day event included a full morning and afternoon of paper presentations, a dinner for invited guests, and then a tour of excavation sites near the city. The paper presentations on Friday focused on enhancing the visibility of archaeological cultural heritage preservation. The speakers were a diverse group of practitioners, including archaeologists, professors, attorneys, and representatives from the US Embassy in Rome and the Management and Promotion of Cultural Heritage, amongst others. The conference, hosted by the American Institute for Roman Culture, Direzione Generale per la Valorizzazione del Patrimonio Culturale, U.S. Department of State, and Centro Studi Americani, was streamed live from the library space of the Centro Studi Americani. Some of the topics covered included the use of marketing and social media to promote tourism of cultural sites, preservation of areas such as Ostia Antica Archaeological Park, restitution of cultural property, and cultural heritage management. In addition, the Institute plans on releasing an e-publication of the papers presented. After the conference, invited guests were treated to a lovely dinner at Ristorante Spirito di Vino in Trastevere. The restaurant and its wine cellar is famous for its historical and archaeological significance, as it was the site of the discovery of multiple significant Roman antiquities; thus it was the perfect location for a group of art professionals. On Saturday, conference speakers and attendees were invited to a tour of the excavation site at Villa Quintilli, a Roman villa along the Via Appia Antica. The villa was built by two Quintilius brothers during the second century, and the home was so beautiful that the Emperor Commodus executed the brothers in 182 in order to seize their home. The attendees next visited another site along Via Appia Antica, Capo di Bove. The site was the property owned by Herodes Atticus and his wife. And finally, to end the busy conference weekend, some of the participants took a short tour of sites along Palatine Hill. To learn more, visit the American Institute for Roman Culture and the Unlisted Conference. Leila Amineddoleh is an Intellectual property attorney and Chair of the Art Law Group at Lombard & Geliebter LLP in New York City. The ARC Centre of Excellence in Policing and Security (CEPS) at Griffith University, Brisbane, Australia will hold a workshop gathering international and Australian scholars and experts in the field of art crime detection, investigation and prosecution to discuss contemporary issues on 1 and 2 of May 2012. The workshop has been organised by Dr Saskia Hufnagel (CEPS), Prof Duncan Chappell (University of Sydney) and Prof Simon Bronitt (CEPS). 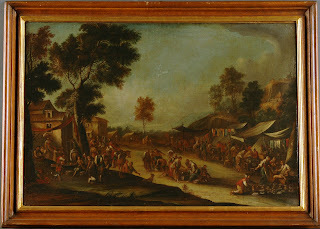 It is directed in particular at assessing the areas of art theft, fraud, and illicit trafficking of cultural property, which have so far not received significant attention in the field of Australasian criminal law and policing research and practice. It attempts to uncover the nature and scope of the art crime problem in an Australasian context and examine how such crime is currently dealt with by criminal justice agencies within this region. 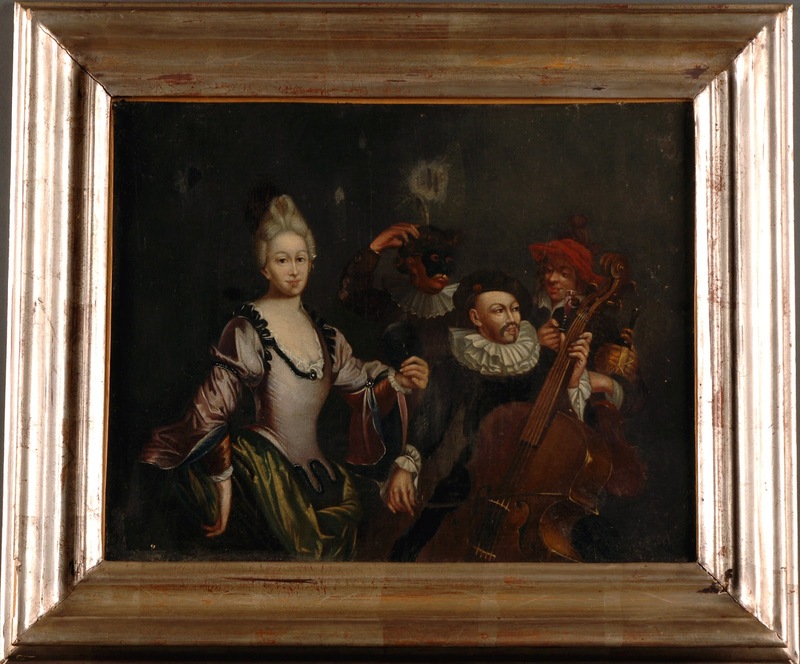 To inform this assessment the workshop applies a comparative perspective from Europe and North America regarding law enforcement and legal methods used to detect, investigate and prosecute art crime. 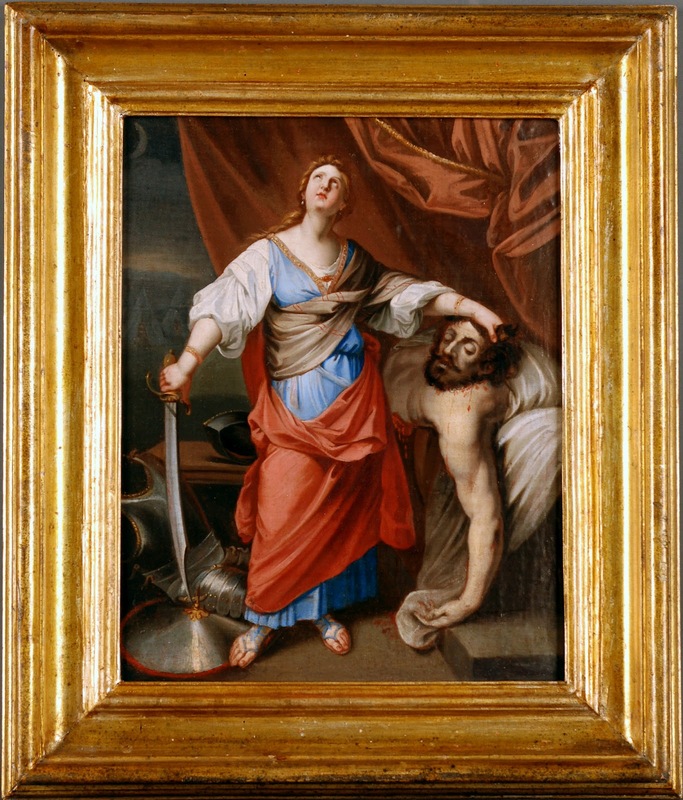 It combines international academic and practitioner perspectives on the art crime problem to foster collaborative present and future research and linkages. The ultimate aim of the workshop is to address similarities and differences between the different regions and determine whether similar problems exist and common solutions can be identified. 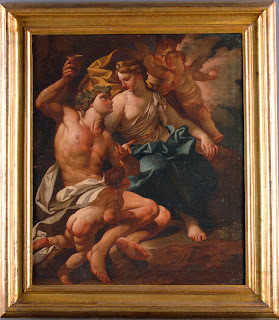 The workshop is of particular significance not only because of the apparent lack of systematic scholarly research and practice in the field of art crime in Australia and the region but also because European and North American studies reveal that art crime is becoming a broadening and highly profitable area of criminal activity. Thus it needs to be determined whether art crime has become similarly significant in the Australasian region. Particular questions which require analysis include whether Australasian art crime is linked to money laundering and other forms of organised crime including the financing of terrorism. A further topic that has not been dealt with in most other regions of the world, but which is of particular concern in Australia, is fraud and illicit trafficking associated with indigenous art. While the academic perspectives gleaned from this workshop will be invaluable, practitioner inputs are believed to be crucial to its success. The workshop will therefore also include representatives from Australian police services, the Australian Crime Commission, prosecutors and judicial officers; Australian customs and border protection officials; the insurance industry, museums and art dealers. Key note speakers include Prof Neil Brodie, Prof Ken Polk, Prof Duncan Chappell, Prof Noah Charney and Mr Vernon Rapley. Observers include representatives from Victoria Police, New South Wales Police, the Australian Federal Police and other law enforcement agencies. The outcomes of the workshop are twofold. One outcome of the workshop is an edited collection, comprising papers by participants. The second outcome of the workshop is to lay a foundation stone for a much broader research agenda on art crime in the Australasian region. It will also contribute to the 2012 Annual CEPS conference in Policing and Security (4-5 October 2012) which will include a significant section on art crime investigations. Both the workshop and the conference will be drivers for an application for an ARC Linkage Project on art crime in the Australasian region. 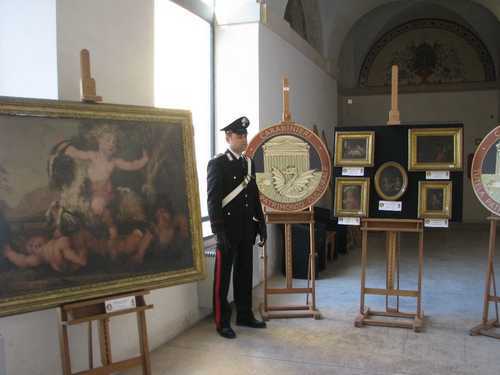 Earlier this month, the Carabinieri's del Reparto Operativo Tutela Patrimonio Culturale di Roma (TPC, Division for the Protection of Cultural Heritage) recovered 37 paintings that had been stolen from a private residence in 1971. 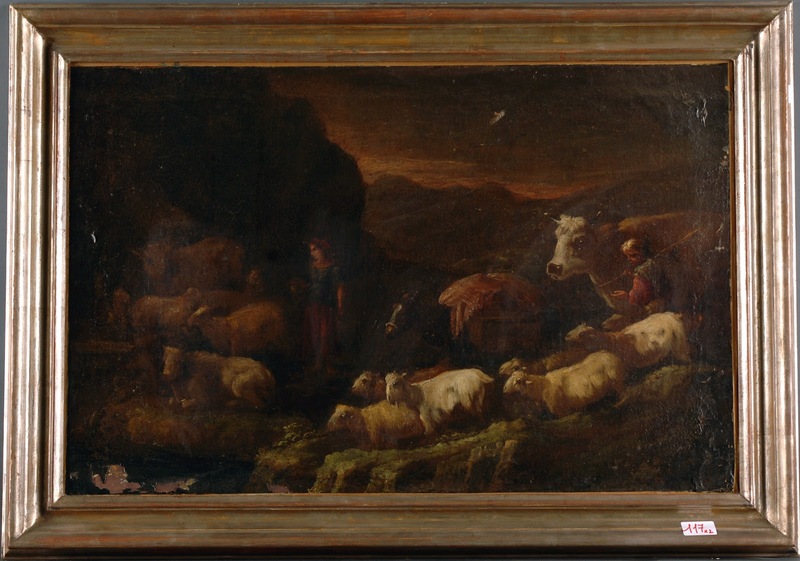 The artworks hadn't left Rome's Parioli neighborhood from where they had been stolen. 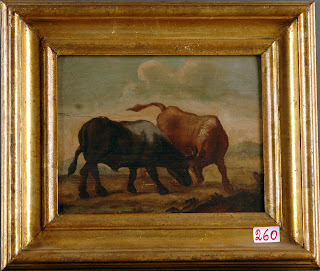 Apparently, a couple had purchased 37 of the paintings twenty years ago in a private sale. 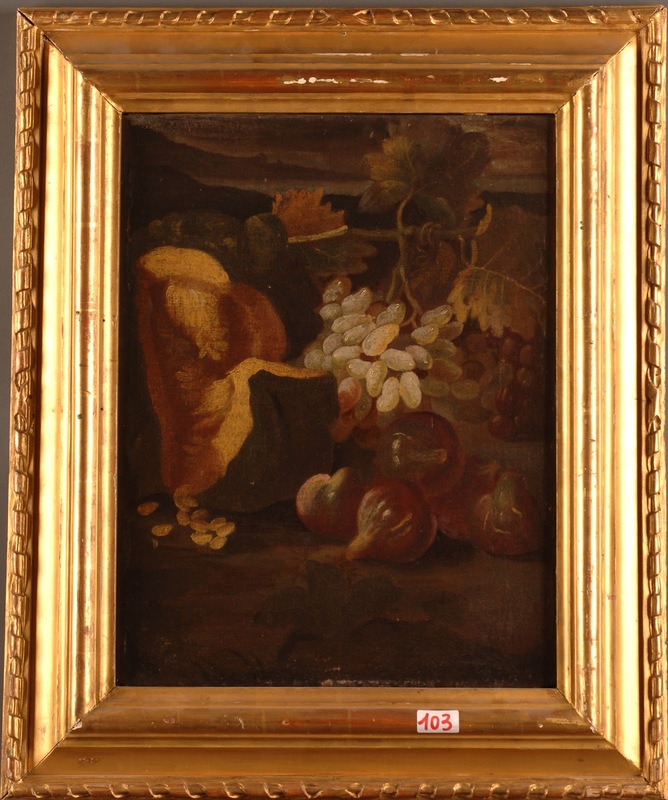 When the husband died, the 50-year-old widow placed four of the paintings in an auction sales catalogue. 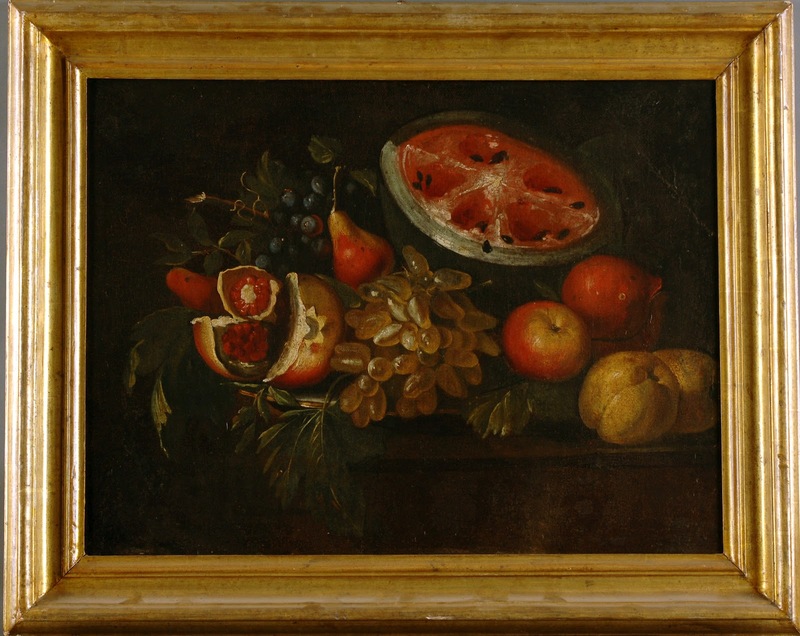 In a routine operation, a Carabinieri officer had matched those images to the TPC's stolen art database which contains more than 3 million stolen artworks. 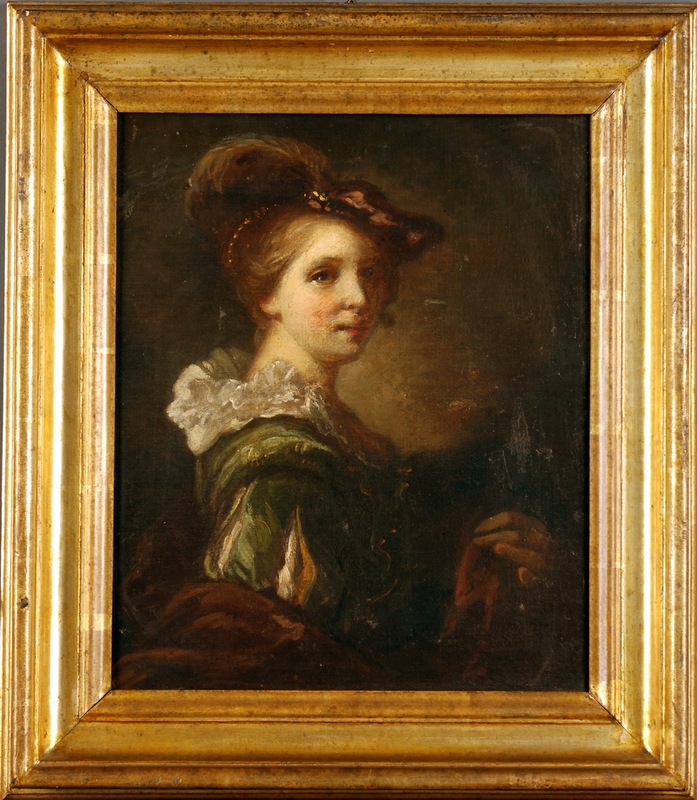 Eleven paintings stolen in 1971 were found in the woman's home in Rome and another 26 works in another home located outside the city. 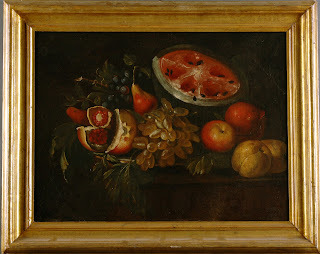 Oil on canvas, school of Caravaggio, depicting still life with fruit, 40x66 cm. Tempera on wood panel, Taddeo Gaddi (1290-1366), Crucifixion, 55x23 cm. Would you have recognized these paintings as stolen if they had been in the home of a friend? 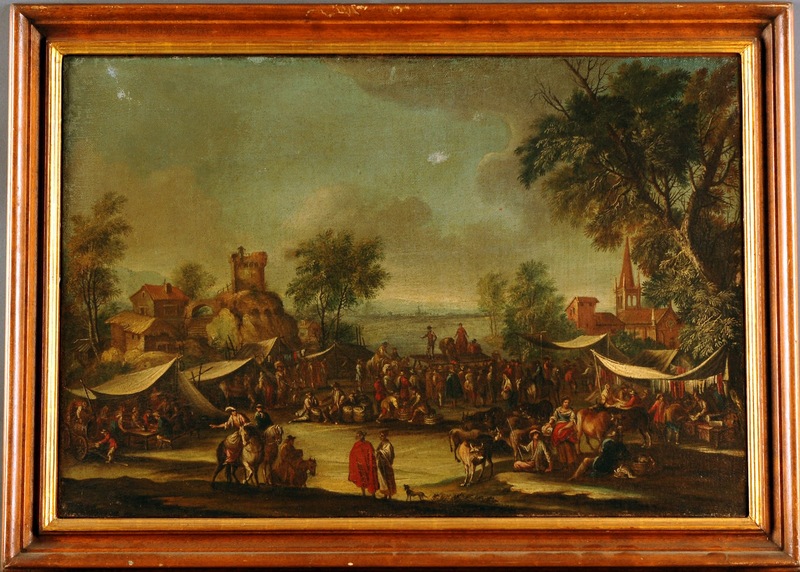 The Carabinieri TPC listed the images of the paintings recovered earlier this month from a home in Rome's Parioli district because these are the paintings which were stolen from another house in the same neighborhood more than 40 years ago. A Carabinieri officer recognized the images in an auction sales catalogue in a routine check against the TPC's stolen art database of more than 3 million artworks. 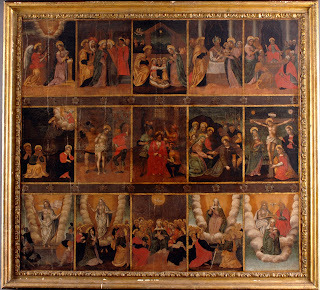 Thirty-seven paintings were recovered. 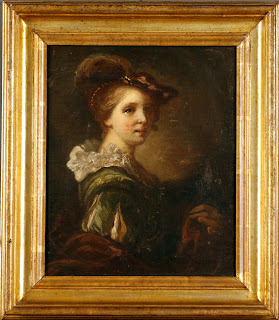 On March 9th Tom Kingston for The Guardian reported "Stolen paintings recovered in Rome 40 years after art heist" which you can read here. 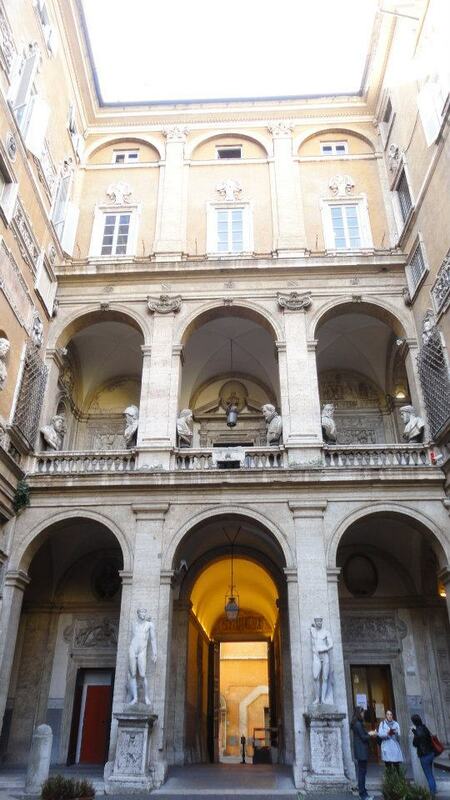 Nick Squires reported from Rome for the Daily Telegraph here. Noah Charney wrote about the discovery in his column, The Secret History of Art. Where were the paintings found in Rome? "Italian police find stolen paintings hanging in a house in the same district of Rome from where 42 works disappeared." The Parioli district is an elegant residential area which also includes the Villa Giulia and the Galleria Borghese. 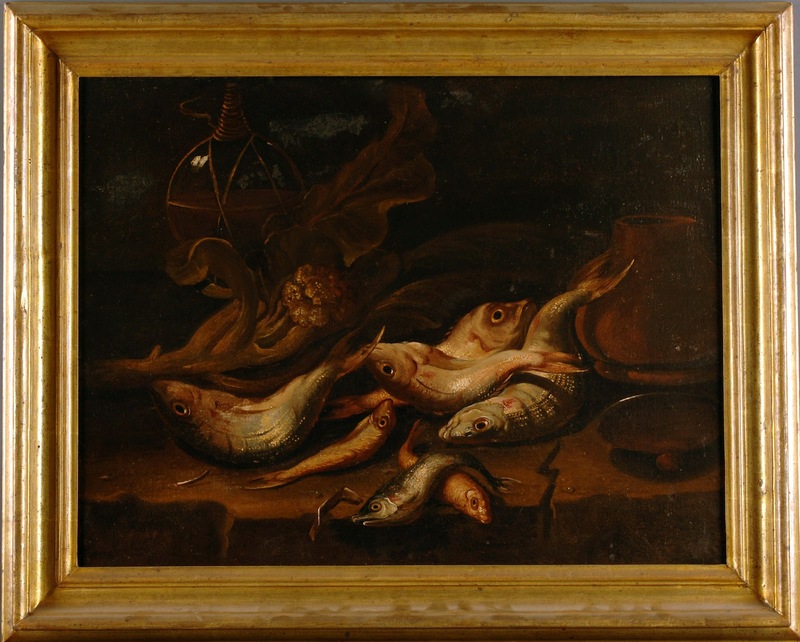 Thieves had not shipped the paintings out of the country. 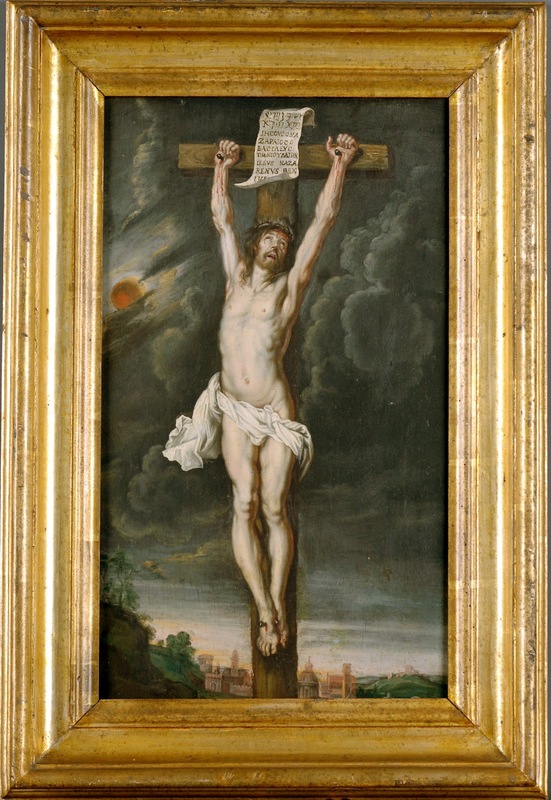 Eleven of the paintings were likely on display in a private home for two decades. 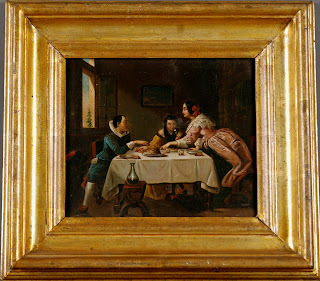 How many guests spent the night or ate dinner in this home of stolen paintings, never recognizing the paintings as stolen or maybe not knowing or remembering that another residence had been burglarized in 1971 in the same area? 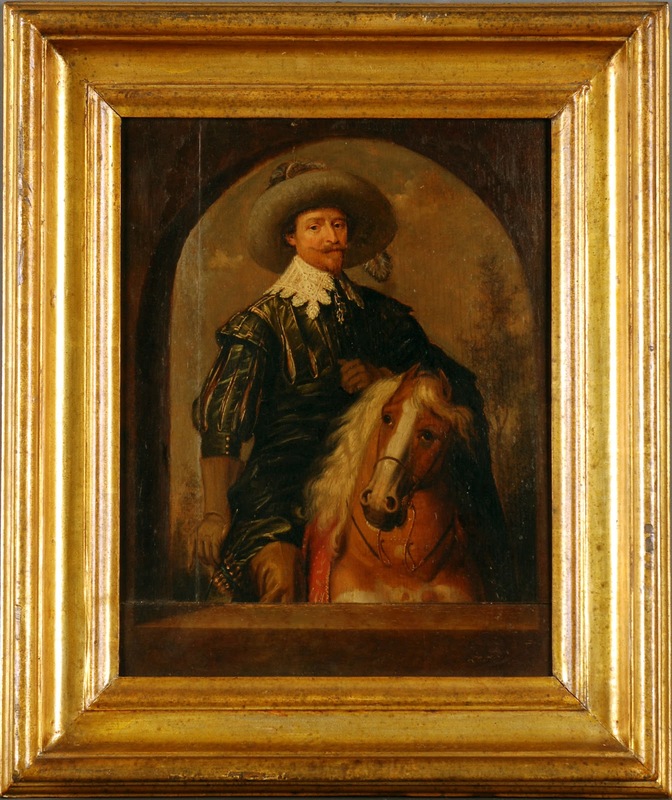 Interpol's Stolen Art Database had a record of these paintings but access to this information is limited. 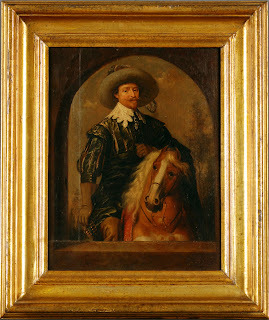 Public access to Interpol's Stolen Art Database was not made available until 2009. 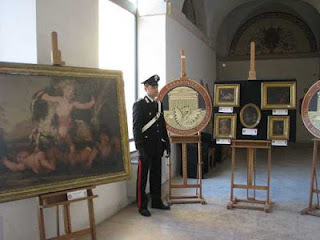 The public has limited access to the inventory of millions of paintings reported stolen to the Carabinieri. 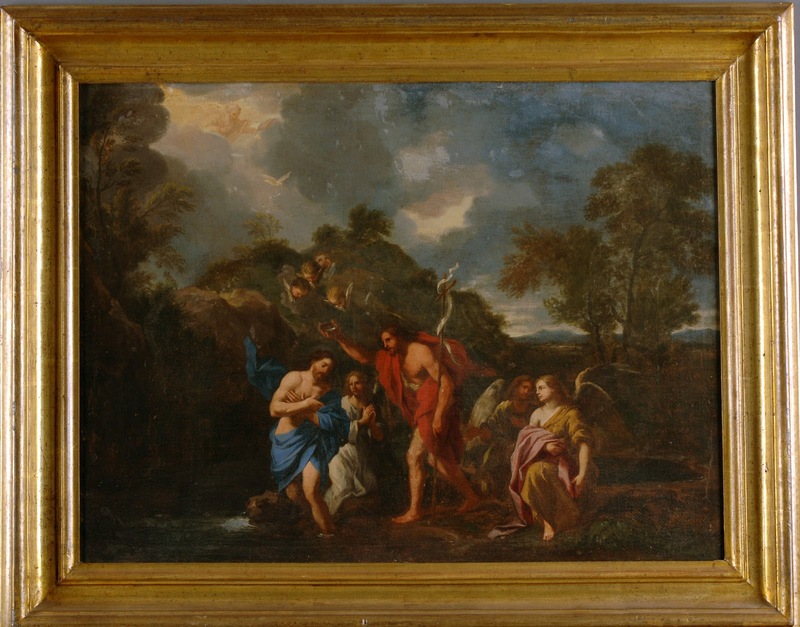 How did the police find the stolen paintings? 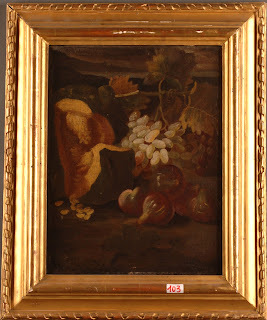 The owner, a widow, put four of the paintings up for sale. 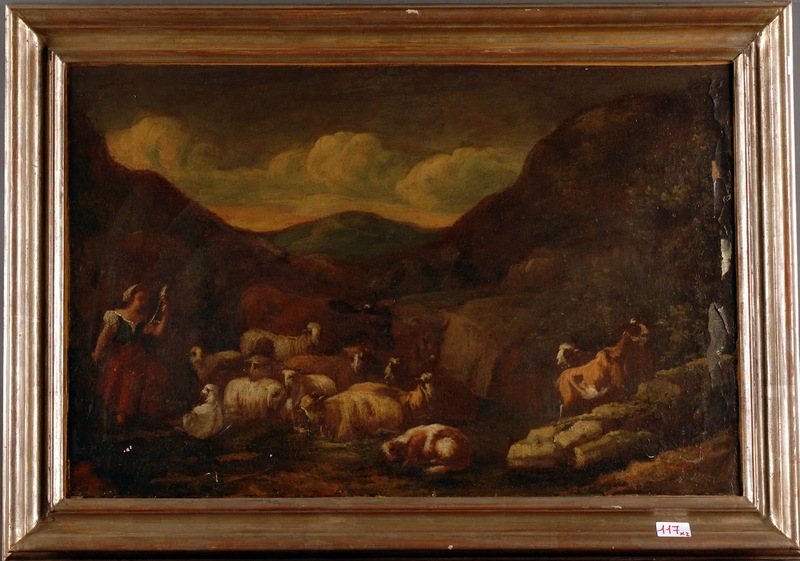 In a routine check between for sale items and the stolen art database, Comando Carabinieri Tutela Patrimonio Culturale (TPC, translated to the Carabinieri Cultural Heritage Protection Operations Department) identified the four paintings as stolen in 1971. 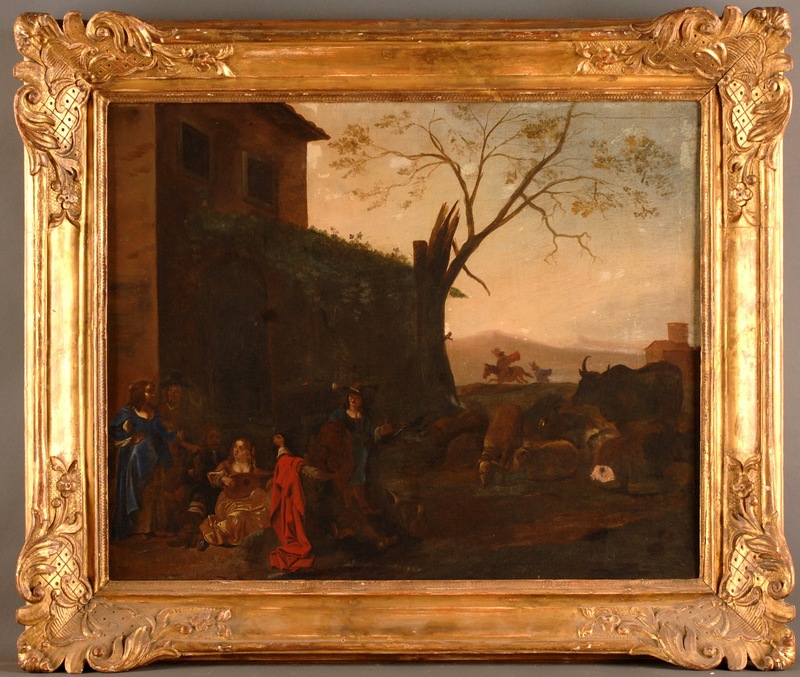 Here's the link to the press release by the carabinieri on the recovery of 37 of 42 paintings dated from the 13th to the 19th century which were stolen from a private residence in Rome. The TPC's investigation started in the first week of February in coordination with the Public Prosecutor of Rome. 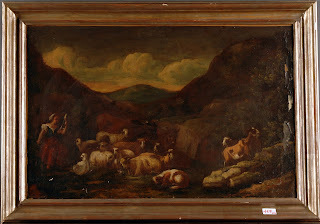 The woman tried to sell four of the paintings at auction was arrested for possession of stolen property. Tomorrow's post will feature the images of the most recovered paintings as provided by the Carabinieri TPC. 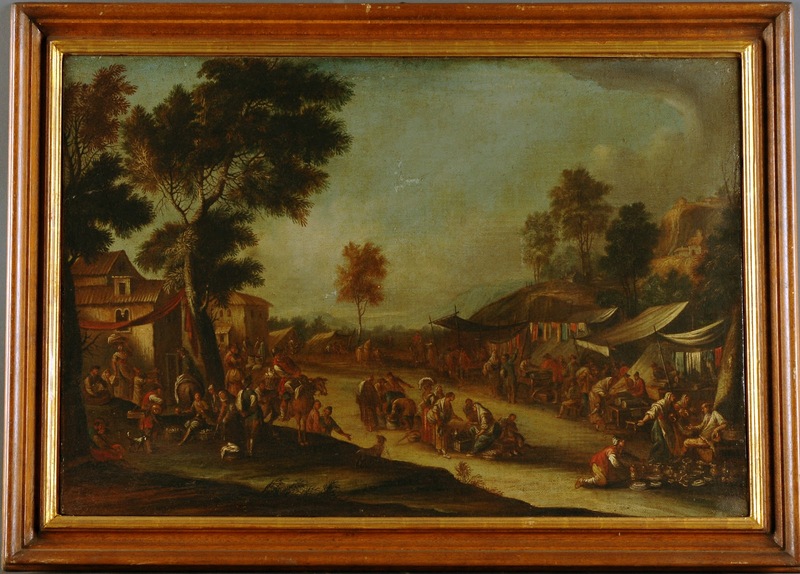 Would you recognize these artworks as stolen if you saw them hanging on the wall of a friend's house? NEW YORK CITY -- A new book bringing attention to the topic of art crime is a motive for a celebration. And indeed, that was the feeling that one could perceive at the Flag Art Foundation when attending Joshua Knelman’s launching party of his new book, “Hot Art: Chasing Thieves and Detectives Through the Secret World of Stolen Art”. Far away from the typical afternoon where audiences sit and listen to the author, the presentation of the book came with a twist. To begin with, the place served the purpose fantastically: not only is the Flag Art Foundation located in New York’s art district, but it also occupies the ninth and tenth floors of a high rise, becoming a fantastic place designed to admire contemporary art. The space is contemplative, filled with light (thanks a lot, Daylight Saving Time 2012!) and the atmosphere serves the purpose of both enjoying the art hanging in the walls and presenting a book that deals with the topic of art as a victim. The author was there to greet the guests as they arrived and among them, a representation of ARCA students from the 2011 MA program: taking advantage of the author’s willingness and kindness, we have shared various opinions on the topic of his book. When the moment came, Mr. Knelman addressed the audience to give a brief description of a lengthy 5-year investigation that became the book. His talk has been a reminder of important figures who were at the reception. Mr. Knelman first mentioned my dear colleague Professor Emerita Laurie Adams, with whom I had the pleasure to share conversations at our respective workplace, John Jay College, until her retirement. Professor Adams wrote in 1974 the innovative book “Art Cop. Robert Volpe: Art Crime Detective”. This mention allowed Mr. Knelman to address the lack of properly trained police officers, not only in many parts of the world, but also in a city that is known worldwide as the most important art market, referring to New York. To prove his point, he referred to the starting point of his book, where Los Angeles’ detectives Don Hrycyk and Stephanie Lazarus make their first appearance on its pages. Another important person in the world of art crime who was among the audience members and whose figure Mr. Knelman wanted to highlight was Col. Matthew Bogdanos, author of the book “Thieves of Baghdad". Col. Bogdanos narrated in first person his quest to recover many of the artworks that disappeared after the siege of this museum in 2003, when the building was left unprotected. Mr. Knelman not only thanked his work, ensuing a round of applause, but also pointed out the hardships of Col. Bogdano’s task as an example of the difficulty of solving these cases. However, the book deals not only with interviewees coming from a law enforcement perspective. 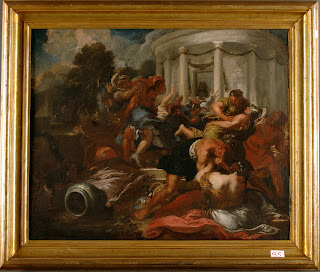 Mr. Knelman provided in his talk the example of Paul, aka Turbo, an art thief, whose life is explained in several chapters of the book, highlighting the complexity of the illicit art trade. Also, I had the pleasure to chat with Col. Bogdanos: we both share a career in courts (albeit in opposite sides: he is a prosecutor, while I devoted my time to criminal defense), and a passion for researching into art crime. 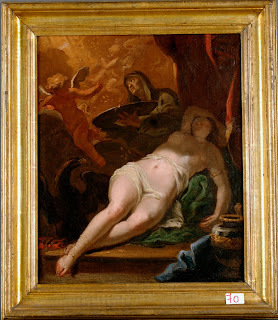 He pointed out that the lack of dedicated law enforcement agents in the field of art crime was explained, in his opinion, because of the particularities of this form of crime, and how these investigations were usually lengthy and complicated. Because of the urgent need for more research into this criminal phenomenon, he stated how he admired the premise of ARCA. In sum, a fantastic New York afternoon to congratulate Mr. Knelman’s new book. LOS ANGELES - Journalist Joshua Knelman, author of Hot Art: Chasing Thieves and Detectives Through the Secret World of Stolen Art, spoke before an intimate crowd at an informal book signing Tuesday night at Book Soup on Sunset Boulevard. Recovering from jet lag after arriving from an international book fair in Beijing where he had spoken to a large crown of English-speaking expats, Knelman, settled into a corner of the bookstore, and pointed out the presence of one of the people featured in his book: Giles Waterfield. Mr. Waterfield, an Associate Professor at the Courtauld Institute of Art, is currently a guest scholar at the Getty Research Institute (The Artist's and Photographer's Studio). 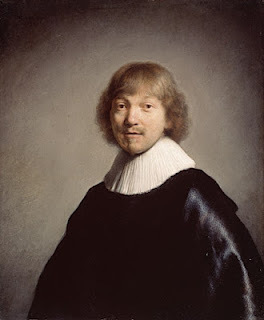 In 1981, he was director of the Dulwich Picture Gallery in London when on vacation in Scotland he read a newspaper headline "Rembrandt Stolen for Third Time." 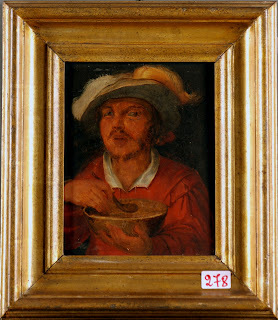 Rembrandt's Jacob de Gheyn III, nicknamed The Takeaway Rembrandt, had been stolen. Knelman recounts Waterfield's recovery of the small Rembrandt portrait in Chapter 7 under the title "Headache Art". Joshua Knelman was just 26 years old and head of research at the Canadian magazine, The Walrus, when he covered a burglarized art gallery in the Forst Hill section of Toronto. He soon found himself having coffee at the Caffe Doria in the Rosedale area with the man who would admit to having committed the theft -- a pleasant enough person who tried to manipulate Knelman into accepting the stolen property. One of the questions raised to Knelman from the audience was the question of legacy -- the recent murder conviction of former Detective Stephanie Lazarus, whom Don Hrycyk on the Los Angeles Police Department's Art Theft Squad had been training to succeed him in 2009 at the time of her arrest, brought up again the issue of who will continue the work of Hrycyk. Knelman said that the LAPD has not yet found a successor and that Hrycyk is currently working without a partner. "Detective Hrycyk, with 39 years on the LAPD, is the 8th most senior officer of 10,000 police officer," Knelman said. "Although there is no retirement age in the LAPD, it will take years for Hrycyk to train someone." Another question asked was as to why there were so few art crime squads in North America. "The units are in the secondary markets of Los Angeles and Montreal and not the primary art markets of New York City and Toronto," Knelman said. "Clearly there should be one in New York. Recovery rates increase when detectives have the time to spend getting to know the art community, building trust with the art dealers and collectors. Unlike other property crimes, recovery of artworks may take decades." And where does the stolen art go? asked another person. "That is the billion dollar question," Knelman said. "There are two separate categories. 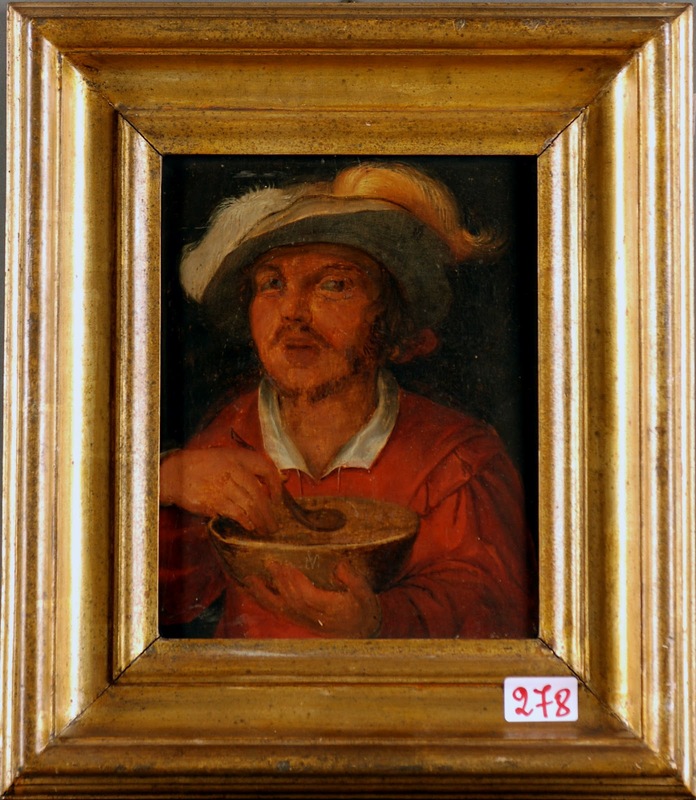 The very famous stolen masterpieces can be used as currency, but the other stolen artworks, 95% of the stolen art which is valued at less than $100,000 or even $25,000, is laundered back into the art market, stolen in Los Angeles, sold in New York and displayed in Vancouver." Knelman will be discussing his book, Hot Art, tonight at 8 p.m. at The Flag Art Foundation in New York City. You can read more about his book here on the ARCAblog.